Since Gary and Alex began re-enacting the early and late Roman period respectively, they have had an interest in medicine and surgery (despite neither being a medical professional in real life, to the relief of the community). Gary often portrays Tranquilus, an early imperial Roman surgeon from the first century AD, and Alex has decided to learn a more honest trade than gambling. In this section, we discuss how we portray the work of a medicus, a Roman army wound surgeon, shortly after Augustus’ army reforms which included the formalization of the army medical service. In researching this topic, the writings of Galen and Celsus are invaluable, but secondary works by the British Museum’s Ralph Jackson and Italian pathologist-turned-historian Guido Majno (‘The Healing Hand’) help bring to life their writings, with the latter drawing upon his career in medicine to get to the heart of the subject. 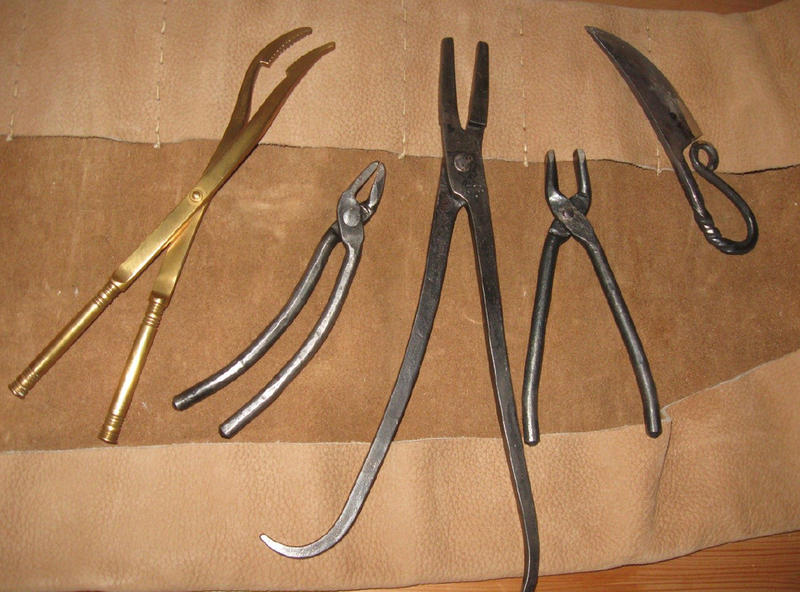 Left to right: a bone saw (for amputating the bone); scalpel (for cutting through soft tissue only); general forceps; specialised forceps (particularly for removing the tonsils); cautery iron (to cauterise tissue post-operation, minimising infection); trephination set (for head wounds). Left to right: male catheter (to be used in the removal of bladder stones); reeds (for covering the barbs of arrowheads during removal, to prevent further damage); artery clamp; tubular drain (for draining fluid, e.g. 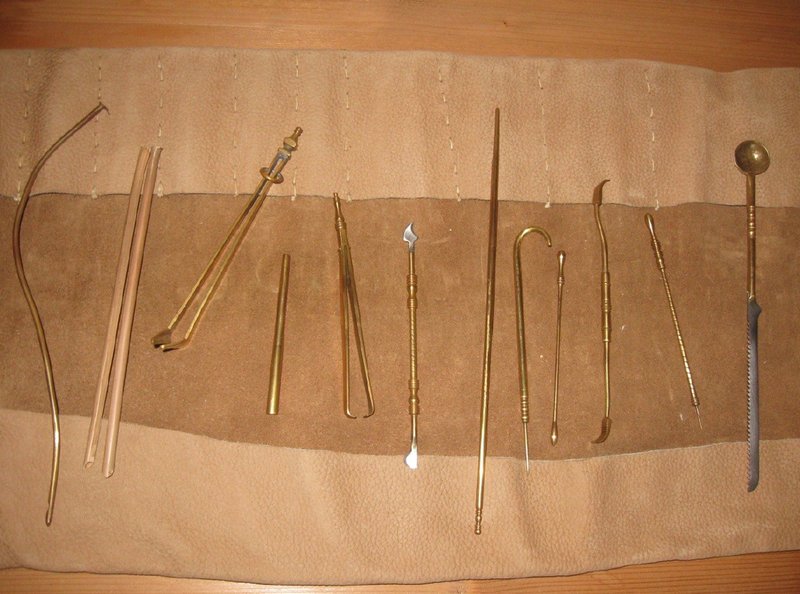 after abdominal operations); tweezers; phlegm (for bleeding, used with a bleeding cup); long probe; hooked probe; short probe; bone lever (probes and bone lever used to manoeuvre tissues, vessels and small bones out of the way when beginning an operation or internal examination); cataract device (tool used, probably among other things, for the removal of cataracts from the eyes – sharp end for the actual removal, the bulbous end for the administering of drops afterwards); multipurpose tool (no consensus on its exact purpose, this is a relatively recent London find copied by our friend Steve Wagstaff, the Roman Trader, who supplied most of our medical tools. It has a steel knife blade with saw on the reverse, and a possible bone marrow scoop at the other). The instruments in these first two pictures are representative of a well-stocked surgeon’s set, enabling a variety of operations to be performed. A few points are worth noting: first, that, as known through archaeological finds, especially those from the medicus’ house in Pompeii from which most of these instruments are copied, bronze is the main material used. More interesting is the observation that, particularly on the second photograph, a lot of the instruments had multiple applications with different ends. The ‘cataract tool’ could be used to both perform the operation and administer aftercare, and the ‘multipurpose tool’ seems to be capable of carrying out a wide variety of generic procedures. Why do this rather than produce purely single-purpose devices? Well our interpretation is that, like Swiss-army knives, having one tool which can do multiple actions is simply easier and more useful. Plus it saves on the cleaning. We know from the writings of authors such as Celsus and Galen that, although not disinfected in modern terms, instruments were thoroughly washed in hot water between procedures, which had the many benefits of making the operation easier (as the clean bronze would not be marred by blood, thereby more visible and to a small degree reflective, plus sharp edges would not be obscured), reducing the risk of infection (especially when compared with Early Modern era surgery and the appalling conditions associated with Nelson’s navy), and probably inspiring patients’ confidence. Left to right: bone forceps; three dental pliers made of steel; razor. Evidence has led to speculation that, as a way of earning extra money from the army’s captive audience, surgeons may have turned to other related trades, such as dentistry or shaving. The dentistry tools above are representative of archaeological finds from across Europe, and, as a personal anecdote, were instantly recognisable to Gary’s dentist on the day he decided to show off his new tools! For removing teeth, the stronger steel pliers would bus used to pull out the bulk of the tooth, with any small remnants being best taken out with the more delicate bronze forceps. John Bee consistently refuses to allow these procedures to be put into practice. 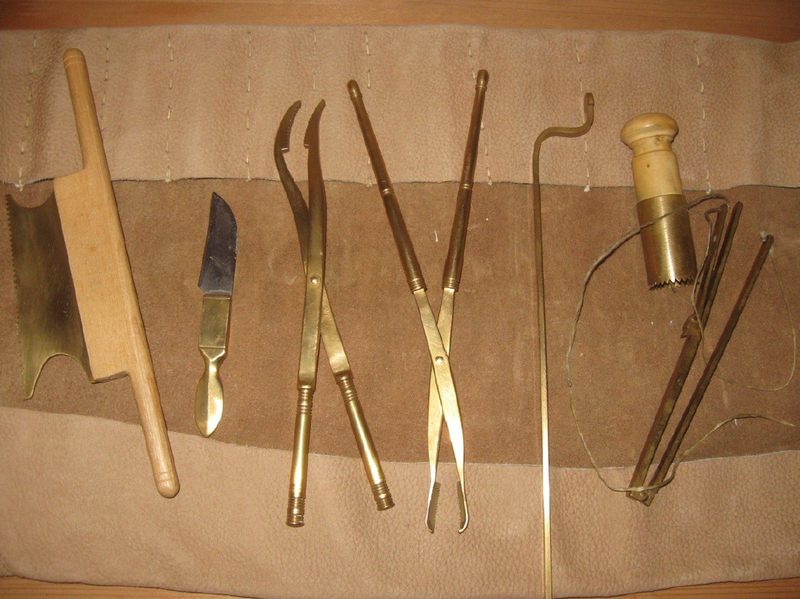 Left to right: small sieve; steel scissors; bandage box; selection of bronze (curved) and bone needles. 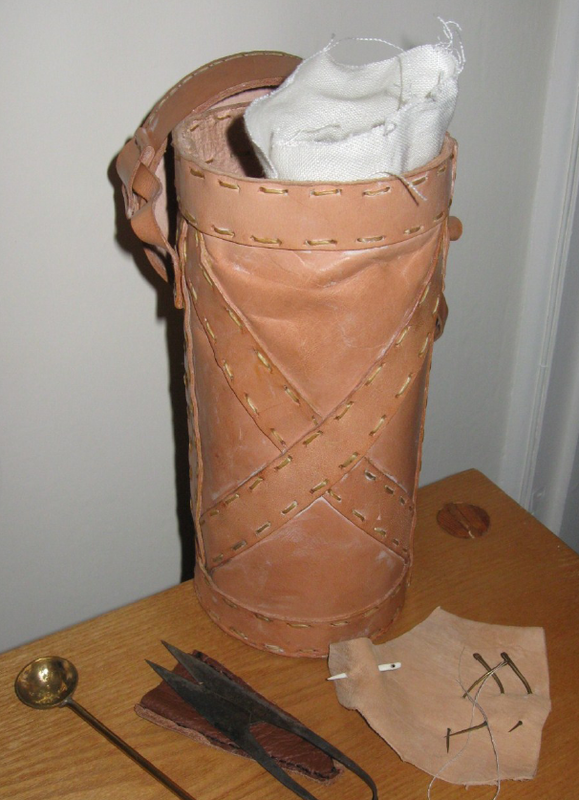 Before the wounded soldier was taken to the wound surgeon (medicus) back at camp, the first medical professional he would encounter would be a capsari – a battlefield orderly distinguished by the capsa bandage box he carried. Like modern-day frontline army medics, it would be the bandage bearer’s job to patch up the wounded as best as possible, perhaps administering a small amount of opiate to relieve the pain, before they could be carried or sent back to camp for the medicus to begin treatment. Coming next… the role of medicine (as opposed to surgery), medical aspects of religion, and our step-by-step guide to a common wartime procedure, with our willing friends acting as the walking wounded.